Saeed and Hameed were arrested and indicted of several charges over the top court's landmark ruling of February 1 to release political prisoners. 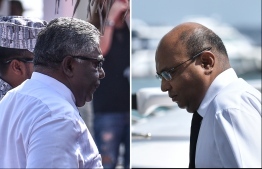 The state charged the two former justices and former Chief Judicial Administrator Hassan Saeed with accepting bribes, under accusations that Jumhooree Party founder Qasim Ibrahim's Villa Group had paid for expensive properties in Malaysia that were acquired by people linked to the three. The court also nullified the case against Qasim Ibrahim's son Siyad Qasim, who was arrested and charged with giving bribes, in the case. The court annulled the charge, stating that the prosecution had not submitted evidence that proved Villa Group had paid for the properties in Malaysia.